Infancy, or the period of the newborn, is, according to standard dictionaries, the beginning or the early period of existence as an individual rather than as a parasite in the mother’s body. Dictionaries also define an infant as a child in the first period of life. According to legal standards, an infant is an individual who is a minor until reaching the age of legal maturity, which, in America today, is eighteen years. According to medical terminology, an infant is a young child, but no specific age limits are placed on when the individual ceases to be an infant and becomes a chid. Many psychologists use the word infant in much the same way as members of the medical profession do and, like them, fail to set an age limit on infancy. This gives the period an ambiguous status in the life span. The word infant suggests extreme helplessness, and it will be limited in this book to the first few weeks of life. During this period, the newborn’s complete helplessness gradually gives way to increasing independence. Each period in the life span is characterized by certain developmental phenomena that distinguish it from the periods that precede and follow it. While some of these phenomena may be associated with other periods, they appear in a distinctive form during infancy. Following are the five most important characteristics of this period. Infancy begins with birth and ends when the infant is approximately two weeks old, by far the shortest of all developmental periods. It is the time when the fetus must adjust to life outside the uterine walls of the mother where it has lived for approximately nine months. According to medical criteria, the adjustment is completed with the fall of the umbilical cord from the navel; according to physiological criteria; it is completed when the infant has regained the weight lost after birth; and according to psychological criteria, it is completed when the infant begins to show signs of developmental progress in behaviour. Although most infants complete this adjustment in two weeks or slightly less, those whose birth has been difficult or premature require more time. Period of the Partunate (from birth to fifteen to thirty minutes after birth). This period begins when the fetal body has emerged from the mother’s body and lasts until the umbilical cord has been cut and tied. Until this is done, the infant continues to be a parasite and makes no adjustments to the postnatal environment – the environment outside the mother’s body. Period of the Neonate (from the cutting and tying of the umbilical cord to approximately the end of the second week of postnatal life). The infant is now a separate, independent individual and is no longer a parasite. During this period, the infant must make adjustments to the new environment outside the mother’s body. Even in difficult births, it seldom takes more than forty-eight hours for the fetus to emerge from the mother’s body. By contrast, it requires approximately two weeks to adjust to the new environment outside the mother’s body. Although the human life span legally begins at the moment of birth, birth is merely an interruption of the development pattern that started at the moment of conception. It is the graduation from an internal to an external environment. Like all graduations, it requires adjustments on the individual’s part. It may be easy for more some infants to make these adjustments but so difficult for others that they will fail to do so. Miller has commented, “In all the rest of his life, there will never be such a sudden and complete change of locale”. The rapid growth and development which took place during the prenatal period suddenly come to a stop with birth. In fact, there is often a slight regression, such as loss of weight and a tendency to be less strong and healthy than at birth. Normally this slight regression lasts for several days to a week, after which the infant begins to improve. 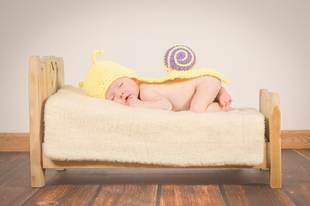 By the end of the infancy period, the infant’s state of development is usually back to where it was all the time of birth. The halt in growth and development, characteristic of this plateau, is due to the necessity for making radical adjustments to the postnatal environment. Once these adjustments have been made, infants resume their growth and development. While a plateau in development during infancy is normal, many parents, especially those of firstborn children, become concerned about it and fear that something is wrong with their child. Consequently, the infancy plateau may become a psychological hazard, just as it is a potential physical hazard. Newborn behaviour is more like a preface to a book than like a table of its contents yet to be unfolded. Further, the preface is itself merely a rough draft undergoing rapid revision. There are some clues to the nature of the book in the preface but these are in code form and taking them as literally prophetic is likely to lead to disappointment. Infancy is a hazardous period, both physically and psychologically. Physically, it is hazardous because of the difficulties of making the necessary radical adjustments to the totally new and different environment. The high infant mortality rate is evidence of this. Psychologically, infancy is hazardous because it is the time when the attitudes of significant people toward the infant are crystallized. Many of these attitudes were established during the prenatal period and may change radically after the infant is born, but some remain relatively unchanged or are strengthened, depending on conditions at birth and on the ease or difficulty with which the infant and the parents adjust.